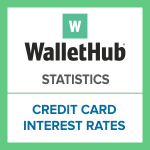 The following represents historical data on credit card interest rates in the United States. These rates are presented as functions of credit card delinquency, national unemployment and credit card charge-offs. The margin reflects the differential above the Prime Rate. Credit card interest rates are quite revealing, as they speak to changes in the economic environment, allow for historical comparison, and enable consumers to determine if they are getting a good deal on their credit card. Furthermore, they can be used to unearth seasonal trends in credit card offers and therefore time applications more fortuitously.